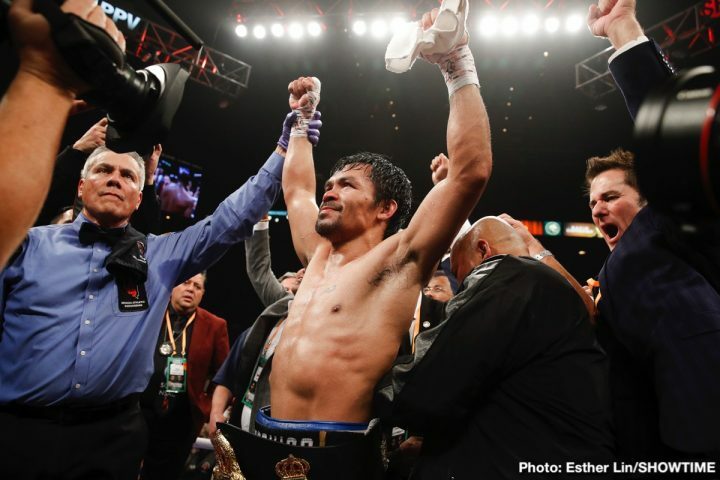 By Mike Smith: Manny Pacquiao (61-7-2, 39 KOs) retained his WBA World welterweight title with an easy 12 round unanimous decision with over a passive looking Adrien ‘The Problem’ Broner (33-4-1, 24 KOs) on Saturday night on SHOWTIME pay-per-view at the MGM Grand in Las Vegas, Nevada. The scores were 117-111, 116-112 and 116-112. 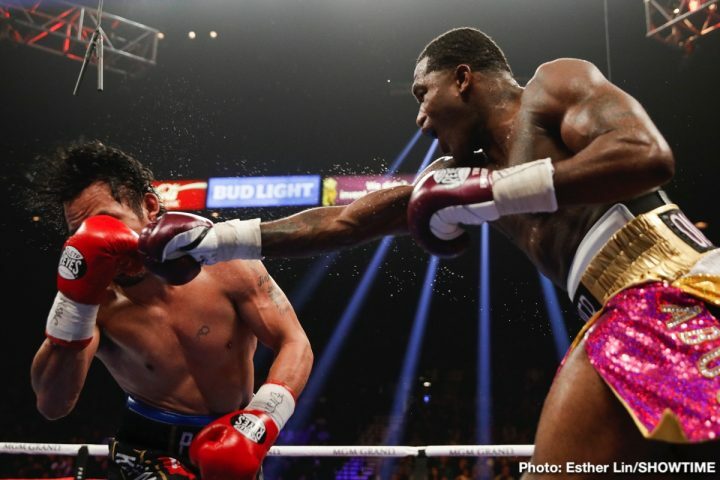 The judges’ scores were very generous to the 29-year-old Broner, as he appeared to win only the fourth round. 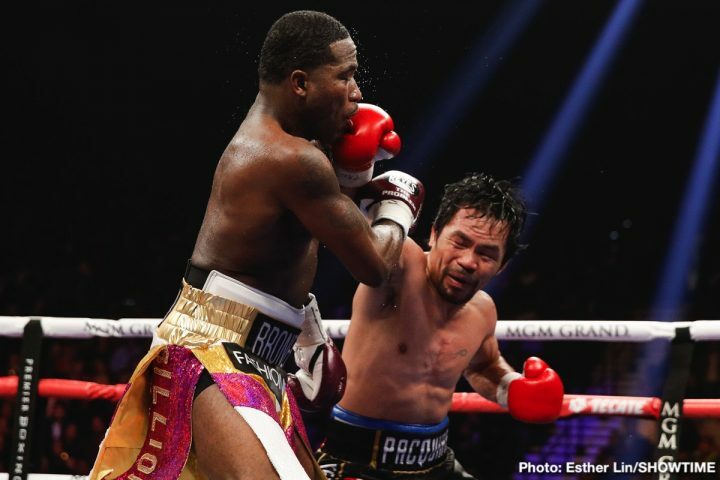 Boxing News 24 scored it in Pacquiao’s favor by a 119-109 score. 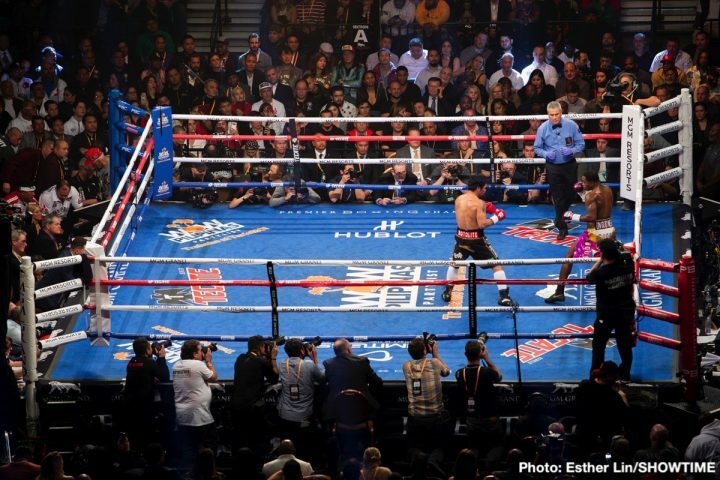 Pacquiao got the better of Browne in 11 of the 12 rounds. 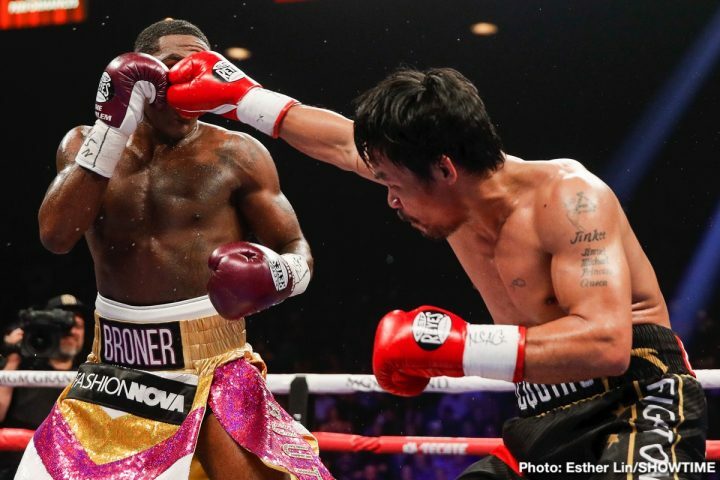 The two judges that scored the fight 116-112 for Pacquiao gave Broner four rounds, and that’s hard to fathom. He didn’t appear to win more than one round. 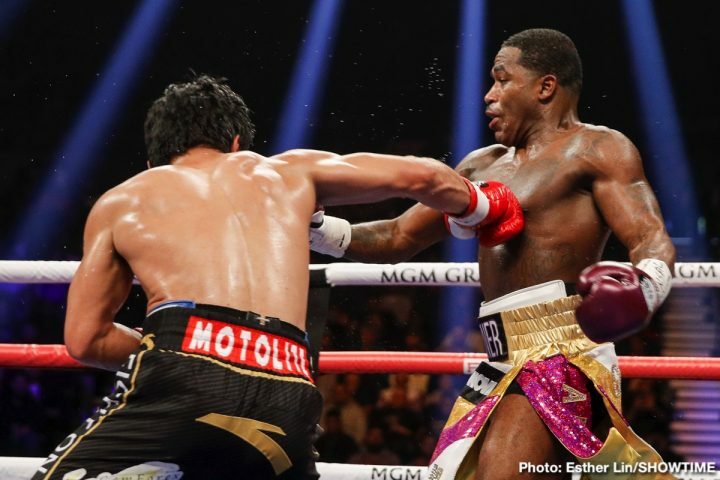 After the fight was over, Broner embarrassingly raised his hands, as if he was the winner. He then stood on the ropes, posing. 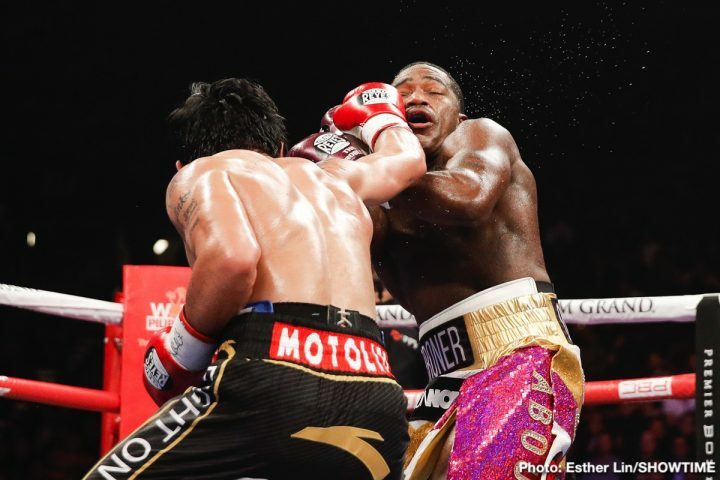 Broner had to know that he hadn’t done enough to come close to winning. It would have been better for Broner to humble himself by just waiting for the scores quietly. 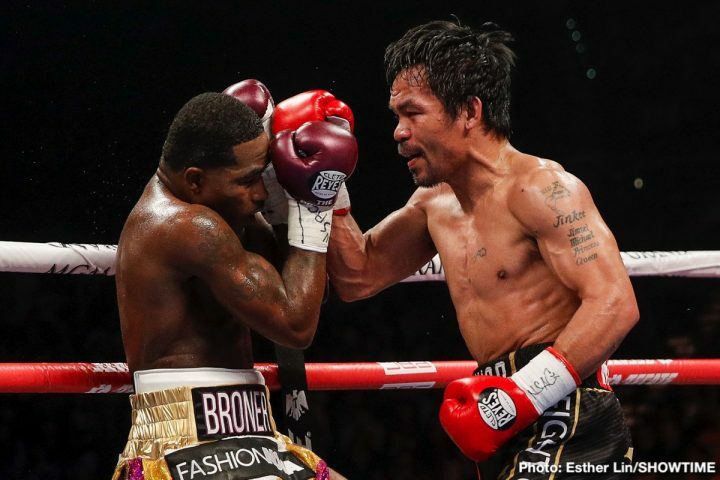 Pacquiao, 40, fought like he was the younger fighter of the two. He outworked Broner by a wide margin, which was expected, because he’s known for having a high work rate. Broner spent most of the right covering up, running, watching the clock and doing anything he could to stall out the rounds. It was hard to believe that Broner is a four division world champion, because he fought nothing like a former world champion tonight. Broner fought more like a guy that is completely washed up. 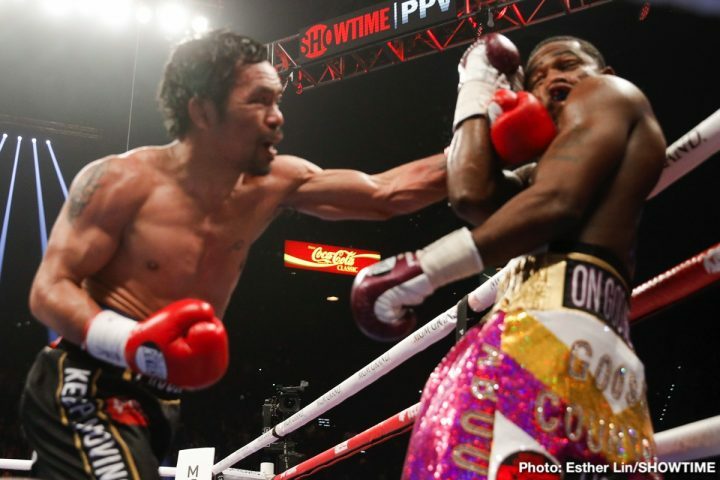 With the win, Pacquiao has put himself in position to face Floyd Mayweather Jr. in a rematch. There are rumors that Pacquiao and Mayweather will be facing each other later this year in a rematch on September 14 on SHOWTIME PPV. If that’s the case, Mayweather was keeping things quiet during the fight. He was interviewed, and he didn’t say anything about coming back to fight Pacquiao. 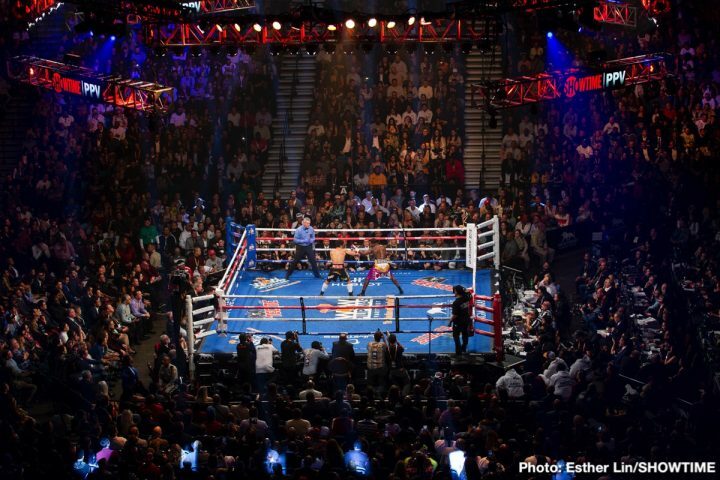 If Mayweather doesn’t agree to fight Pacquiao, then the Filipino star will likely face the winner of the Errol Spence Jr. vs. Mikey Garcia fight. Those two will be fighting each other on March 16 on SHOWTIME PPV. Spence is considered to be the favorite to win the fight. As good as Pacquiao looked tonight, he likely won’t do well against the younger, stronger and much bigger Spence. As for Broner, he needs to think whether it’s time for him to retire from boxing. 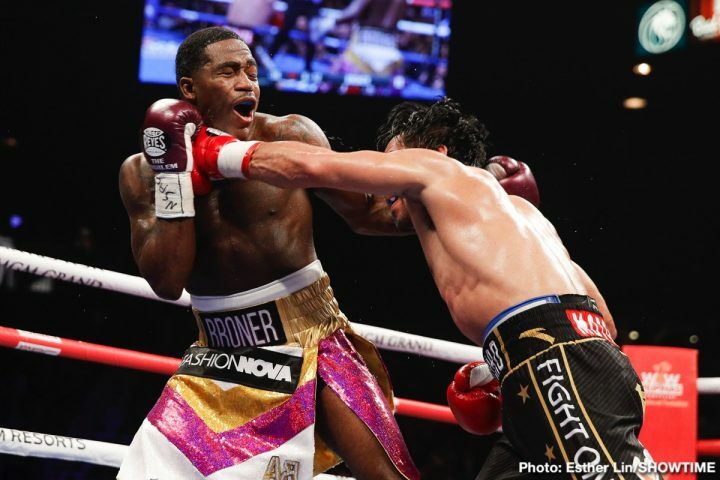 The loss for Broner was his third in his last seven fights. Broner appeared to lose to Adrian Granados in 2017. If you take away that win, Broner hasn’t won a fight since 2016. He does not look like the same guy that held titles at super featherweight and lightweight. He’s slow, sluggish and he doesn’t throw enough punches to win at the elite level at welterweight. If Broner could move back down to lightweight or super featherweight, he might have a chance to win titles, but it’s unlikely he can make weight for those weight classes at this point in his career. Broner would have a lot of problems cutting weight to get back down to 130 and 135. 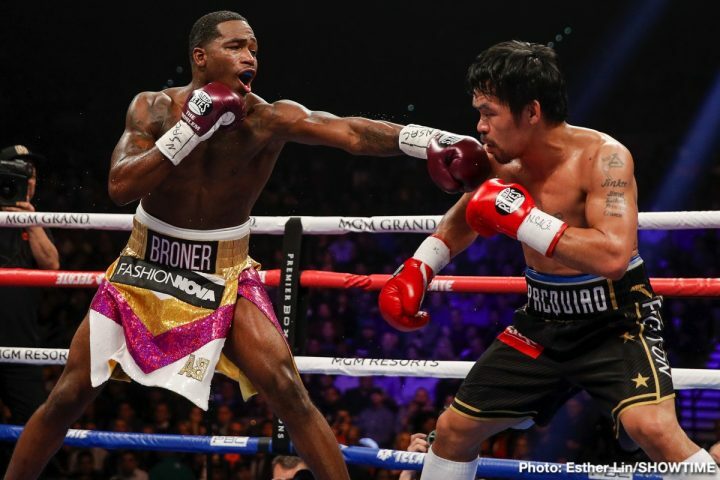 With Broner no longer being dependable to win fights at light welterweight and welterweight, his days of being a useful B-side fighter are fast running out. It was a bad idea for Premier Boxing Champions to have given him this opportunity tonight to fight for a world title against Pacquiao, given his lack of wins in the last three years. If PBC is going to continue to put Broner in fights that he can’t win, it’s going to hurt the ratings, and obviously what’s left of his career. 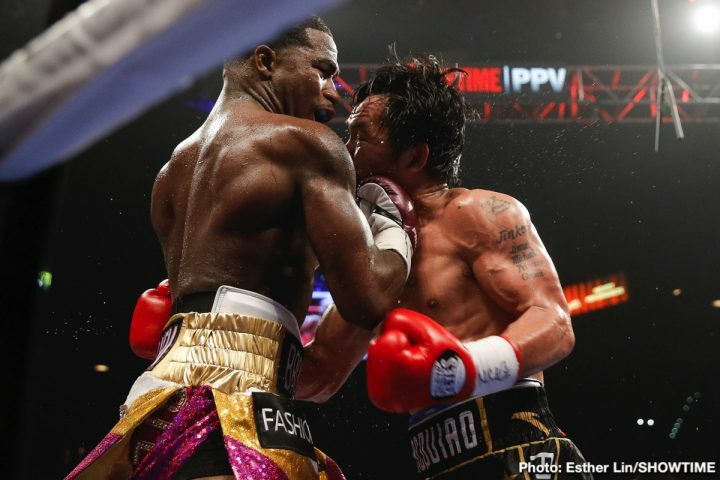 Broner needs to be matched against fighters at his talent level, not against world champions.